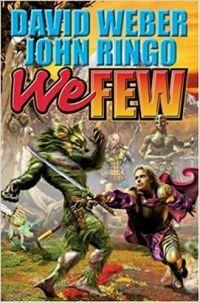 We Few is the fourth and final book in the excellent Empire of Man series by David Weber and John Ringo. Prince Roger and his team finally make it back to his world and he now finds himself needing to rescue his mother, the empress of man. This book is pretty different from the earlier three because it is not about surviving a hostile planet against deadly natives. Then again, Prince Roger's world is not really that different. His mother is under the control of Roger's father by blood but not by love. They setup a restaurant that serves Marduckin food as the perfect cover and a gain allies in order to save the empress. This final book was pretty good at showing the evolution of Prince Roger and a good ending to the series. There were a few memorable moments that made this a good book but not a great one. I give it four out of five stars.